The Ridge Route (for profit Corporation) and associated duplicate web sites: ridgeroute.com and .org formerly donated free space on these sites to the Ridge Route Preservation Organization (RRPO), a separate company incorporated as a 501 C-3 (Not for Profit) Public Benefit Corporation. Although the accounting and book keeping procedures have always been separate the Board of Directors of the RRPO voted to separate the two corporations. Doing this will allow the RRPO to expand efforts to raise funds and generate public interest to help save and hopefully reopen the 1915 historic highway closed since 2005. Pursuant to the above decisions the Ridge Route Corporation has given the RidgeRoute.Org site to the RRPO Corporation. All future NEWS and information regarding the 1915 historic Ridge Route highway will be displayed on the ridgeroute.org site. The ridgeroute.com site will continue to display the history of the road as well as sell history books and a Huell Howser video about the road. Additionally the early history of the RRPO organization will remain on this site. Tour 1. 9:00 a.m. to 11:30 a.m.
Tour 2. 10:00 a.m. to 12:30 p.m.
Tour 3. 11:00 a.m. to 1:30 p.m.
Tour 4. 1:00 p.m. to 2:30 p.m.
Tour 5. 2:00 p.m. to 4:30 p.m.
You must have a reservation to participate (No Exceptions). Reservations must be made in advance at Mike's Diner 31537 Castaic Rd., (661) 257-3233. Please be advised that a standard size vehicle is required, (No low sports cars or Dune Buggies). The road is in rough condition and your car will get dirty in locations where pavement is missing. There are NO facilities available, e.g. restrooms, food or water. You must make a reservation in advance and be present for the tour you select otherwise you will forfeit your reservation. To maximize participation and accommodate demand NO SINGLE OCCUPIED VEHICLES ARE ALLOWED. Historic photos of the Ridge Route and classic cars will be on display at 4:00 p.m. In July 2005 Los Angeles County vacated their portion the original 1915 Ridge Route Highway within the Angeles National Forest (ANF) boundary. During the vacation process, ANF (failed) to re-establish three (3) easements north of Templin Highway. These three parcels of property within ANF are â€œgrandfatheredâ€� having been there before ANF was established in 1908. In order for the Ridge Route to re-open, Angeles National Forest has to negotiate new easements with these â€œgrandfatheredâ€� property owners. Unfortunately, some of the owners may NOT wish to re-establish the easements. It is my understanding that Forest Service policy does not recognize â€œprescriptiveâ€� rights-of-ways,â€� and they do not pursue legal action to re-gain easements nor do they invoke emanate domain if an agreement cannot be reached. Clean up the Ridge Route! along the un-maintained section of the Historic 1915 Ridge Route within the Angeles National Forest. We meet at the Ranch House Restaurant in Gorman. EXIT I-5 at Gorman off ramp, turn east to Gorman Post Road. Turn right, (Chevron station on left, Motel on right). The Ranch House restaurant is behind the Motel in same complex. We meet in the room on your left just beyond the cashier. If you would like to join us for breakfast, please arrive at 8:00 a.m. Please allow ample time to arrive so you will NOT miss our 9:00 a.m. departure from The Ranch House Restaurant. We work towards and exit from the southern entrance to the Angeles Forest. We will be clearing the road of rock and debris. Vegetation will be cleared, only if necessary. We hope to complete work by 2:30 p.m. to 3:30 p.m. Please bring gloves , sunscreen , a sack lunch and a folding chair to use at lunch time. We break for lunch around 12:00 noon. Bottled water is provided by the RRPO. Safety is our number one priority. Please wear appropriate work clothes and shoes. to extend our repairs beyond that portion of the road that is closed and off limits to the public. Please RSVP for head count! I met with Mr. Tom Contreras, Angeles National Forest (ANF) Supervisor, on July 29, 2013. The purpose of the meeting was to discuss how the Ridge Route Preservation Organization (RRPO) and the forest service could agree on procedures that would advance various restoration projects we are attempting to undertake on the historic 1915 Ridge Route. Without describing each project, in this update I will focus on the road itself. Although the Ridge Route is listed on the National Register, we have worked six years toward having the road listed as a â€œNational Forest Scenic By-Way.â€� This additional designation does NOT have any impact on the ANF budget, but does have the caveat that, THE ROAD MUST BE OPEN. To Mr. Contreras' credit, he stated that he would allow our scenic by-way paperwork to â€œgo through process.â€� Additionally he said that ANF would undertake a cost analysis of just how much money would be required to bring the road up to a level of safety. Neither Mr. Contreras nor I can state when the road will re-open, however, if all the stars align in our favor, late 2014 might be a possibility. The earth movement in the Osito Canyon area that is threatening a major petroleum line is still being dealt with. Because of the extreme fire danger, no heavy work activity is allowed during our current hot, dry summer weather conditions. On December 21, 2012 I met with the District Ranger that is in charge of the 1915 Ridge Route . I knew that he had concerns regarding opening the road but was not ready for what he disclosed. It seems inclinometer readings in the Osito Canyon region of the road indicate some continuing problems with earth movement. One of the petroleum pipeline companies plans to spend approximately ten million dollars to stabilize the hillside where earth movement could possibly damage their line again. Unfortunately the 1915 Ridge Route provides the path to access the work site. Because of this, the road will continue to be off limits to motorized vehicles. Earth movement in the Ridge Route mountain area has been prevalent for many years. The strata is much like a layer cake that is leaning, however, instead of frosting between the layers of strata it is clay and when the clay gets saturated with water the earth begins to moves. In 2005 the 1915 Ridge Route experienced some major washouts when we had the â€œ100 yearâ€� rain storms. The road washouts were repaired early on however, the pipeline repairs required new â€œright-of-wayâ€� paths and environmental review. The pipeline repair activity was quite complex and was finally completed approximately ten months ago. Unfortunately, the road will remain closed until the Osito site is stabilized. This delays our organization from our continued pursuit in having Angeles National Forest designate the 1915 Ridge Route a â€œNational Forest Scenic By-Wayâ€� because to have this designation the road has to be open for public access. Copyright © 2013 Los Angeles Times. Reprinted with Permission. These links point to PDF files. Since they are rather large they will be slow to load, so please be patient. The Ridge Route Preservation Organization (RRPO) requested a meeting with Angeles National Forest (ANF) to discuss the disposition of the Old Ridge Route. At this time we are waiting to hear from ANF as to when they will be able to meet with us. As you know the RRPO has worked many years to get the road re-opened. We anticipated good news at this time, however, ANF appears to have concerns they want to address before any decision is made. We will post an update after our meeting. The old Ridge Route remains closed except for a 7 mile stretch on the north. To access this portion, transition from I-5 onto CA Hwy 138 which is located approximately 3 miles S/O Gorman. Shortly after you get onto Hwy 138 you will pass Quail Lake on your left and then off to your right you will see a large white mansion that looks like it was the house in the movie â€œGone with the Wind.â€� After you pass the mansion start watching for the old Ridge Rt. which veers off to your right and heads up hill. The road is still maintained all the way to the historic Sandberg Hotel site. You will come to an intersection, Pine Canyon Rd. but continue through the intersection on the Ridge Rt. After you pass Pine Canyon Rd. you will go another mile or two and off to your right watch for some Oak trees with a stone monument beneath them. This is the historic â€œSandberg Hotelâ€� site. You will also see a stone wall and parts of the cement slab that the hotel sat on. We have a picture of the hotel on the monument. This is the location where we ended the Huell Howser program. After you pass the hotel site, the maintained pavement ends but you can continue on with a standard clearance vehicle, just be aware of the pot holes. You can continue south all the way to the historic â€œTumble Innâ€� hotel site where you will see a larger stone wall and a stone arch above the steps. Our Ridge Rt. Preservation Organization, (RRPO) recently re-constructed the arch. A photo of the site is located on the rock monument across the Hwy from the stone wall. Directly beyond this site is a locked forest service gate where you will have to turn about to exit. You are allowed to walk, hike, or bicycle in, just no motorized vehicles. Currently our organization is the only organization allowed behind the gates to work on the road. We go up on the second Sat. of each month, weather permitting to clear rocks from the road and to clear drains. We meet in Gorman then caravan up to the old Ridge Rt. (See: â€œClean up the Ridge Routeâ€� below for details). We bring a sack lunch and take our lunch break around noon. After lunch we continue until about 2:30 or 3:00 p.m. then head home. We provide bottled water. The work is light and we generally have an enjoyable day. For road conditions in California (excluding unforeseen traffic incidents) please call the Caltrans Highway Information Number at 1-800-427-ROAD (7623). By speaking the number of the route desired -- or using a touch-tone telephone and entering the highway/route number of interest, callers can get up-do-date road conditions on any highway in California . Motorists are also encouraged to tune into local radio stations for up to-the-minute freeway reports before starting out on trips. For more information, please call the Caltrans Public Affairs office at (213) 897-3630 or 897-3656 from 8 a.m. to 5 p.m. Monday through Friday. 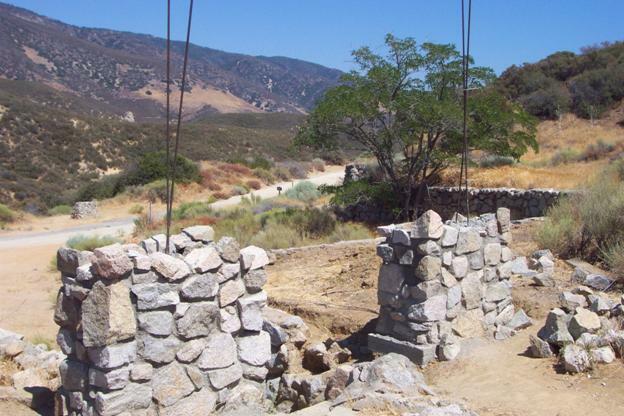 (BACKGROUND) Those of you that follow the efforts of the Ridge Route Preservation Organization (RRPO), its members and volunteers are aware of our ongoing efforts to re-open California's historic highway. The winter rains of 2005 severed the road as well as petroleum, natural gas and electric lines. Angeles National Forest (ANF) arranged to have the Federal Highway Administration repair the road and repave those areas where entire sections slipped down the canyon. One petroleum line remains above ground on the road south of Swedes Cut. When this line is back in the ground the utility repairs will be complete. The road will be inspected and utility companies will be responsible for damage (if any) they may have caused. (FAST FORWARD) Although it has been five years that the road has been closed, new concerns need to be addressed. First, although the road will be drivable given the aforementioned repairs, of greater concern are other areas of the road that have deteriorated to the extent it raises safety concerns. Currently there isn't enough money to repair those areas. Secondly, both the Ranger and the RRPO agree that if the road is â€œthrown openâ€� it will NOT withstand the traffic without having a major negative impact to the historic features of the road. The Ridge Route is identified by GPS navigation systems and when I-5 is closed, it is common practice to use the Ridge Route as a by-pass. Thirdly and most critical is the fact that the planned Tejon Ranch development will severely impact the road. The â€œCentennial Developmentâ€� will provide 23,000 residential units and over 14 million square feet of commercial and retail space. It is the largest single development project ever proposed in California. The â€œMountain Village Developmentâ€� will provide an additional 3,450 residences and up to 160,000 square feet of commercial development including various hotel, spa and resort facilities. (WHAT NOW?) A management plan will be developed to address not only our concerns but the concerns of other organizations e. g. â€œThe California off Road Vehicle Association,â€� theâ€� California Trail Users Coalitionâ€� etc. Bottom line, the road will most likely remain closed to the public and possibly opened on a â€œcontrolledâ€� basis. We will explore if it would be possible to allow our organization to conduct limited tours of the road while a full management plan is formulated. Although for the foreseeable future the road will be closed, the RRPO will continue to support the road with our Tumble Inn restoration as well as road and drainage work. 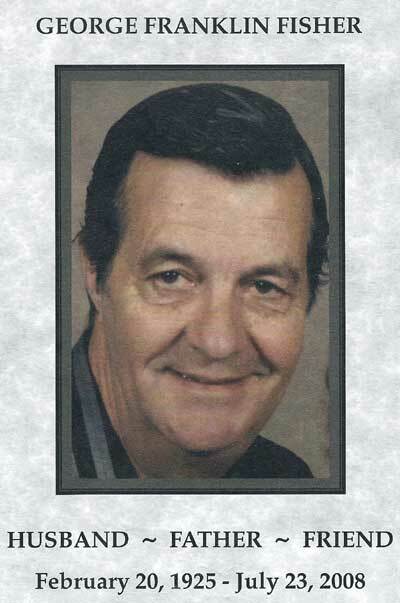 It is with a heavy heart that the Ridge Route Preservation Organization reports the passing of George Fisher. George was a major benefactor and strong supporter of our organization's efforts to have the old Ridge Route repaired after it was closed due to washouts and damage, a result of the winter storms of 2005. 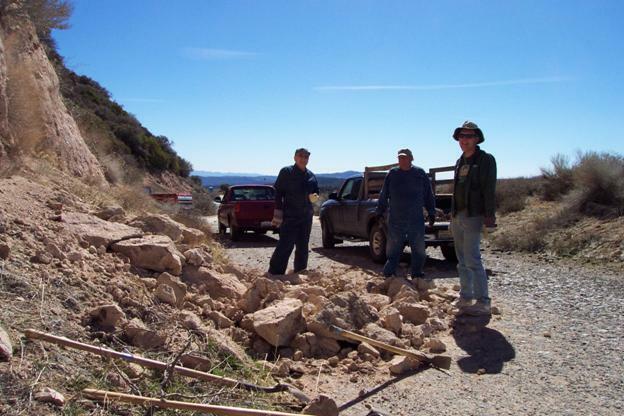 George and his wife, Irene, participated in our â€œClean up The Ridge Routeâ€� work program and encouraged us to â€œstay the courseâ€� in soliciting political support to keep the historic road viable. George retired in 1986 after a long career with the Union Oil Company. His position was Traffic Manager in the company's international division. We will sorely miss him. The 2005 storm that washed out the 1915 Ridge Route also wreaked havoc to oil, gas and power lines within proximity of the historic highway. Southern California Edison and Exxon-Mobil were the first companies to repair their facilities. The Southern California Gas Company and Plains All American Pipeline experienced damage in multiple locations forcing both companies to effect emergency repairs by temporarily relocating their lines above ground away from the slide areas and onto the 1915 highway. The extensive damage presented a logistics â€œnightmareâ€� for the utility companies in terms of access, environmental scrutiny, forest service regulations, applications for new rights-of-way and a repair itinerary that required the blessing of the State Historic Preservation Office (SHPO). The same storm that did all this damage to the historic Ridge Route also closed the Vista del Lago visitor center at Pyramid Lake and reduced the I-5 Ridge Route from four lanes in each direction down to three lanes in each direction at Templin Highway. The highway is protruding upward at this location due to the weight of the mountain on the west side of the interstate. Crews have removed tons of earth from the hillside to minimize the upward protrusion. The interstate will restore to four lanes in each direction when repairs are completed. The old Ridge Route â€œwash outsâ€� have been repaired by the Federal Highway Administration. Repair work on the road was NOT to begin until pipeline crews had finished, however, a â€œchange orderâ€� in the pipeline repair plan forced them to suspend all work until the new plan was approved. This unforeseen event put a serious delay in getting the road open this year but did allow the road contractors a window of opportunity to repair the entire road while the pipeline contractor was waiting for a â€œgo aheadâ€� to resume his work. The new plan was ultimately approved and the pipeline contractor had crews working 12 hour shifts trying to wrap up before the fire season began. Unfortunately they did not finish and have suspended all activity until the fire closure order is lifted. Work will resume when the weather cools, possibly November. We had hoped the road would open in 2008. The projection now is the first quarter of 2009. Harrison I. Scott, Pres. Ridge Route Preservation Organization WWW.RidgeRoute.com . The 1915 Ridge Route is technically a "paved road." OHV's (Off Highway Vehicles) and dirt bikes, in other words, (UN-LICENSED VEHICHLES) are not allowed on the Ridge Route or on the shoulder of the Ridge Route unless you trailer them in then un-load in an area that allows off road activity. When the Ridge Route re-opens an Adventure Pass will no longer be required. The following conversation with Carl Marsee took place on a Saturday in December of 2006 in Gorman, California. Carl currently holds the position of Treasurer with the Ridge Route Preservation Organization. You can read the entire conversation by clicking the link below. I spoke with Harrison Scott at his house in Torrance, California on the evening of August 23, 2006, shortly after assuming editing duties for the organization's newsletter. A brief portion of this conversation was printed in the fall 2006 edition of the RRPO's quarterly publication, The Ridge Route Sentinel. You can read the entire conversation by clicking the link below. The RRPO now has it's own Fresno Scraper thanks to Jack and Sidney Kelley. It is currently on display at the Ridge Route Museum in Frazier Park . The Fresno Scraper was the primary tool used in the construction of the Ridge Route. You can get an idea of our volunteer effort by looking at our efforts from February 11, 2006. Harrison Scott, President of The Ridge Route Preservation Organization and Angeles Forest representatives will be meeting with the project manager for the Federal Highway Administration next week to evaluate damage to the historic 1915 scenic Ridge Route. The winter storms of 2005 caused a 75 foot section of the roadbed to fail and slip down the canyon. Other areas along the road were undermined when the drainage systems failed due to deferred maintenance and budget limitations. Landslides in the area also disrupted oil, gas and electric service. With the road severed and the need to make permanent repairs to the utility lines, Angeles Forest issued a "General Closure" order for the road. You cannot walk, hike, drive or horseback into the area. Safety is the top priority. After the damaged areas are evaluated, plans will be formulated for getting the road repaired. It is too early to project when repairs can be accomplished. Repair work on the road will need to be compliant with environmental requirements which may lengthen the repair activity. The 1915 Ridge Route is one of only two roads in California having the distinction of being on the National Register for its historic significance. If things fall into place the road could open in the first or second quarter of 2007. Construction crews are repairing rain damage to the north and southbound I-5 lanes near Templin Hwy. above Castaic. Angeles National Forest Rangers and the Los Angeles County Sheriff broke up a group of young people conducting a "Rave Party" at Reservoir Summit. A similar event occurred a year ago and resulted in a five acre fire which destroyed several beautiful pine trees at the site. Our appreciation is extended to The California Association of 4-wheel Drive Clubs Inc. in association with Angeles National Forest for installing historical markers along the 1915 Ridge Route. This portion of the old road is that segment that was placed onto the National Register on Sept. 25th, 1997.